When you are applying for a job you might need to write a covering letter for your job application. 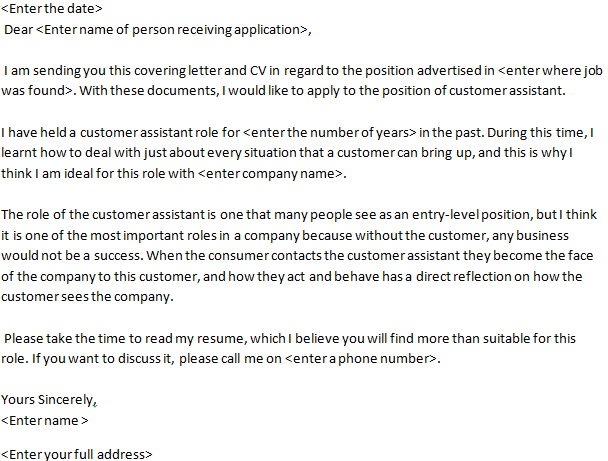 If you need to write a Customer Assistant job application letter then here is an example. You can find many Customer Assistant job vacancies on the job sites. All you need to visit them and start searching for current positions that are suitable for you. Here are some of the most popular UK job sites: cv-library.co.uk, reed.co.uk, totaljobs.com and Learnist.org. Good luck with your job hunt. You can use following example letter for your job applications just after editing the fields adding your contact details including address, telephone numbers and emails. The letter is available in doc, image and text. Click here to view the letter in text. Click here to download Customer Assistant job application and covering letter example.